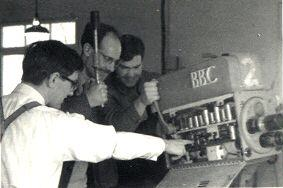 I remember the Marconi Mk ONE……we trained on them at Evesham (Wood Norton) and this picture is of three of us carrying out some ‘impact’ maintenance on one of them! On the left is Phil Upton showing where to hit the camera and wielding the panning handle is Keith Tucker. We were from all the regional studios and I cannot recall the members from Birmingham on TA Course 16 in the Spring of 1963. Try this website for old photos of training courses and other stuff. The course you describe is listed. Thanks for that Scott, I’ll have a look at the site, and see if I can borrow or link to their photos.